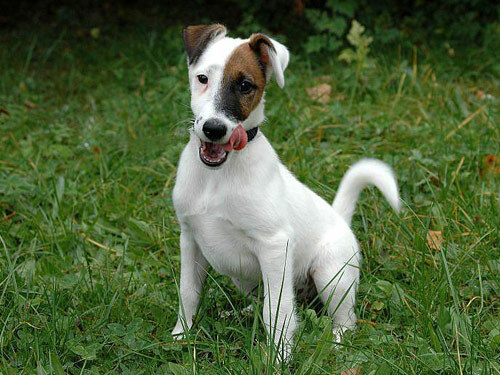 The Smooth Fox Terrier canine is full of energy and personality. They are feisty creatures by nature that thoroughly enjoy being playful and adventurous. While they are also fond of their independence, they do love to roam and chase as well as having the time to explore in an open space. They are exceptional runners and have tendency to bark on occasion and adore digging also. They can make great watchdogs and are not very welcoming to strangers that may enter their homes, but they do not go into a defensive mode, they simply act in more reserved manner. The Smooth Fox Terrier is also very simple to train as a pup and is playful and loving toward children and other dogs most of the time. The Smooth Fox Terrier breed is one that needs attention and does not enjoy not being the center of it at times. They are very active canines that will require that physical stimulation during the day or they can begin to act up simply out of that lack for entertainment. They prefer to reside inside their homes with their owners, but can adapt to warm climates and can live outdoors without much maintenance. This breed bodes that smooth and soft fur coat, which means it will need additional grooming each week more often than a Fox Terrier that has a wire coat. Ear training is something to look into if your vet recommends it to ensure they will develop properly as full grown dogs. This is one area where this breed can be easier to care for over time than some of the other dog breeds as the Smooth Fox Terrier does not commonly bode any major noted health concerns. Some minor ailments they can develop are lens luxation, cataracts, distichiasis and Legg-Perthes disease. Some vets may recommend screening for their eyesight as they age, but virtually every dog reaches a point when this becomes an issue. The average lifespan for a Smooth Fox Terrier is from ten to thirteen years long. They generally weight an average of fifteen to twenty pounds as full grown canines. The date of origin for a Smooth Fox Terrier is noted in the 17th century sometime. It is one of those breeds that has a very grey area of where they exactly came from as far as their ancestors roots, but they were derived from England. They became very popular for heir unique gift of hunting in areas where the lighting was low or dim and they were exceptional for fox bolting and hunting small vermin. Some experts believe they obtained this breed from a cross between a greyhound and a bull terrier. They got their own recognition from the AKC in 1985 that separated them from the other Sporting breeds that were similar to them. They went on to be a useful breed in dog shows and one that was simple to care for and train, making them a somewhat popular house pet currently.